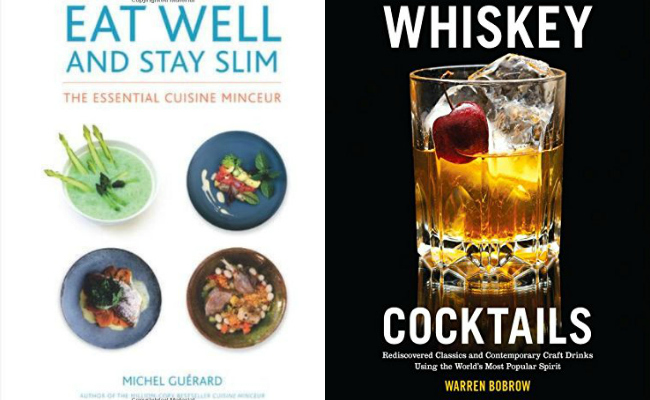 Holiday Gift Guide 2014: 10 Books to Buy for Your Favorite Home Cook | Exploring Food & Drink in D.C.
Not sure about you all, but we LOVE a good cook book (or mixology book). There’s something about a collection of carefully curated recipes, and gorgeous food (or drink) photography that inspires us to be better home cooks slash bartenders. We’re also the type of people to choose which books we buy primarily on the cover. Whoever told you “don’t judge a book by its cover” lied to your face. You should absolutely judge a book based on it’s cover. Unless it’s a book by Martha Stewart. We don’t like her. We receive a lot of pitches from publishers and public relations professionals all trying to get their clients’ work in front of EDC’s audience. And by a lot, we mean daily. That’s a lot of books during the year. So, with the season of giving upon us, and the inevitable struggle of trying to figure out what the person-who-likes-to-cook-but-already-has-just-about-every-gadget-imaginable-in-their-kitchen (you know exactly the type of people we’re talking about), we compiled a list of the 10 cookbooks that caught our attention this year. Why we chose it: We find breads tricky. They’re usually also quite labor intensive, and while learning a recipe we might have found online usually lends itself to relatively satisfactory results, “Bread” by Dean Brettschneider is packed with tips for baking that coveted perfect loaf. Add in the gorgeous carb-loaded photography, the minimalist hardcover, and recipes ranging from Hand-dropped Sultana & Raspberry Scones to Apple & Custard Brioche Tarts and Panettone, and you got yourself one classy gift. Why we chose it: We have a thing for farm-to-table cooking. Knowing where our food came from, and knowing it was locally sourced gives us pride in our consumption. Brock, the chef behind restaurants Husk and McCrady’s, offers all of his southern inspired food recipes in “Heritage” ranging from comfort to refined-for-restaurant-service foods. Although perhaps geared more toward a home chef who knows their knife skills, and has mastered techniques past the base level, we appreciate the tribute to Charleston and Appalachia food flavors and think anyone would enjoy a book of recipes that inspire personal improvement in the kitchen. Reach for the stars people. Or the black truffles. Whichever suits your fancy. Why we chose it: Everything is better stuffed, amiright?! Does your friend enjoy playing with their food, have children, or perhaps hosts “man night”? Then this will be their holy grail. We’re talking recipes for Macaroni & Cheese Stuffed Hamburgers, Saag Paneer Stuffed Shells, Carnitas Burrito Manicotti, and Kung Pao Stuffed Shrimp. In fact, you may get stuffed just from contact with the book. Why we chose it: We love supporting other bloggers. It’s that simple. Stephanie Le, the creator of “I am a food blog”, just published her first cookbook. And if you didn’t notice the title, let us point out what it says. EASY. That’s right. Easy gourmet. We know all too well that sometimes there’s just not enough time (or knowledge in our limited noggin) of how to produce those recipes that require a ton of patience and skill, but that doesn’t mean we don’t like to impress when we cook for others, and we’re pretty sure you have at least that one friend who frets over details and aesthetics whenever they host a dinner party. Why we chose it: It should be obvious why we put this one on our list. We think any food truck frequenter and chronic traveler will appreciate the compilation of recipes from some of America’s best food trucks, including DC’s very own Hula Girl Truck and El Fuego. Why we chose it: There’s something about exceptionally good charcuterie that leaves us in awe. You know what we’re talking about, right? The cold meats that just melt in your mouth with that mouth watering salty, meaty goodness. Bissonnette’s book provides more than 100 recipes and step-by-step instructions. Sections in the book cover cooked charcuterie, offal, cold cuts, cured meats, and confit with recipes ranging from Cured Pork Loin Proscuitto-style to Rabbit Mortadella. Bring on the meat! Why we chose it: We dream about traveling to Africa and various other eastern continents/countries. The cuisine is a bit of a mystery to us. We chose this book because we know we’re not the only people who like to experiment with ethnic flavors and dishes, even though we are lacking a certain understanding. And, while DC has a lot of variation in the type of food offered, we consider ourselves lucky for this. We think this book is a great introduction to flavors us westerners aren’t accustomed to, and a fun way to break the kitchen mold. Why we chose it: Recently Kremezi hosted a book signing event at Zaytinya in DC. Unfortunately we couldn’t make it – book signings usually aren’t our focus – however we couldn’t have thought of a better restaurant to host the signing. It just worked perfectly. If you’ve been to Zaytinya you know by now they have some fantastic Mediterranean vegetarian dishes that make us wish we knew how to cook similarly in our own homes. Kremezi – a renowned cookbook author – provides mouth watering recipes ranging from Pasparaki (Greek style scrambled eggs with preserved pork) to Greek Style Pork Terrine (terrine made from the head and trotters that have been cooked gently with bitter orange and lemon). Give your cook the gift of traveling through Greece without even leaving their kitchen. Why we chose it: While we aren’t typically calorie conscious (seriously give us a double Whopper and it’ll be demolished in the blink of an eye without any regret), we can appreciate that some people are. However we don’t think this book is for your average home cook. The saving grace? We loved the idea that food can still be fancy, filling, and overall beautiful while still being healthy. We’ll reference this book on future cooking endeavors for explanations of principles, techniques, and terms. Having a book on hand that tells you exactly how to make a large variety of stocks, and oils makes it a keeper for kitchen. Why we chose it: OK, so this isn’t a “cookbook” per say…but, whiskey! Everyone is a wannabe mixologist these days – so why not provide a little guidance? We loved the variety of recipes making this the perfect gift for that whiskey connoisseur in your life. Give it alongside a bottle of their favorite brand so they won’t be able to control their excitement and will get that party started. See? It’s a gift that keeps on giving. 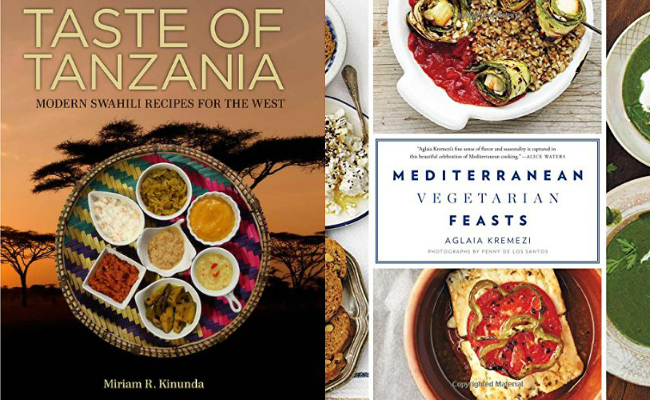 Tags: books, Bread, cookbooks, Easy Gourmet, Eat Well and Stay Slim, Food Truck Road Trip, gift guide, Heritage, mediterranean vegetarian feasts, Stuffed, Taste of Tanzania, the new charcuterie cookbook, Whiskey Cocktails. Bookmark the permalink. Ok, so I want one of each of those LOL. Great list. I LOVE cookbooks too! 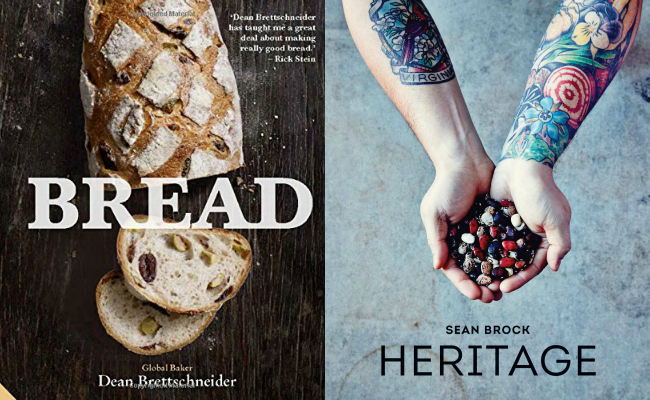 The Sean Brock one looks awesome! Love the image they used for the cover-soo colorful, and eye catching. That bread book is sounding interesting. It’s super unique and great tasting, unique bread recipes are not easy to find! Oh, I’d love to find the Bread book under the tree this year. Making bread is such fun. All of these sound great. I’d love to have all of them. I’m a big time collector of books like these. Taste of Tanzania sounds like it could be a good addition to my collection. 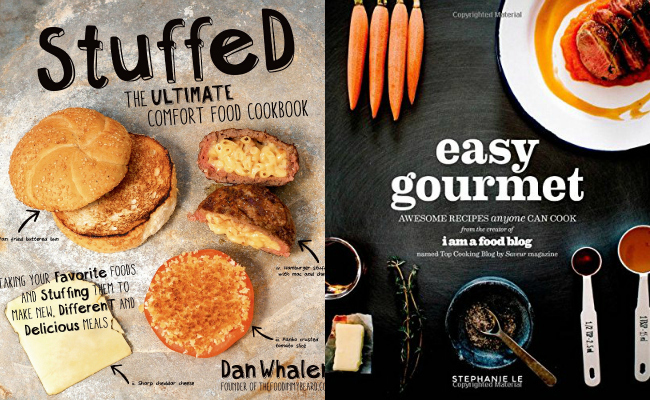 I definitely want to check out the comfort food book! That is right up my alley! I love cookbooks but probably need a new bookcase made just to store them. There are some great ones here. What a fantastic list of cookbooks. Would love to check out the food truck one! I love getting and buying cookbooks. Have a nice collection. I am going to keep this in mind. These are all good options. Great list of cookbooks and I love your reviews! I have a few cookbooks but would love more. I have a cousin who just loves to cook so it’s great to have a few choices. Great list. I’m trying to do more cooking so I want them all! What a great list! I collect cookbooks and want to check a few of these out for myself. Thanks! Thisnis a good list. After all, a cook can never have too many reference books. This is a wonderful list. I may check them out for my mother in law. 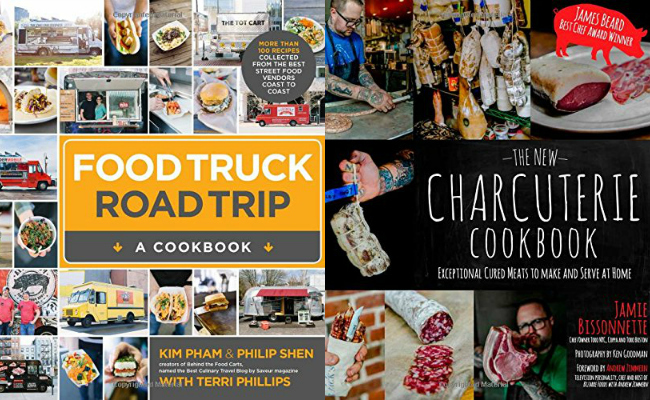 Food Truck Road Trip is a GREAT cookbook!! I am such a food truck/street food hound and had to have it! These sound like some interesting books for sure. I use to collect cookbooks, but I have stopped doing it since I moved in here. These all sound like wonderful gift suggestions for sure. This is an interesting gift guide. I’d never thought about cook books for a cook! I actually started reading Brock’s book front to back – it’s an AMAZING narrative! Also, I wanted to get my hands on the Mediterranean book from Zaytinya – right up my alley!